Unseen footage of The Beatles found in "old drawer"
These days, it seems you can't clean out a garage without finding at least one rare recording of The Beatles lurking among the dust. Fans have unearthed lost videos, unheard audio interviews and now: an uber-rare 8mm colour film of The Fab Four performing in 1964 - discovered in an "old drawer." The two-minutes of footage was taken by 15-year-old Drew Dimmel on 17 September 1964 who was attending an un-scheduled gig on The Beatles first tour of the USA at the Municipal Stadium in Kansas City. The unplanned show was organised at the last minute by The Beatles' manager Brian Epstein, who found it rather hard to turn down a record-breaking $150,000 offer. This is the first time the film has seen the light of day, as Mr Dimmel explains: "I took the film to our local camera store, making no mention of its contents, and waited for them to develop it. 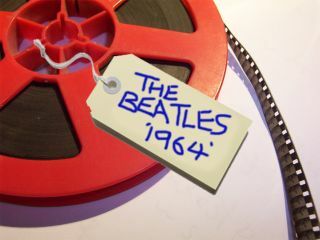 Paying the $4.00 developing fee, I went straight home, checked to see that images on the little reel were The Beatles, opened the drawer of our old desk, placed it in the bottom of the drawer… and there it's been for the last half of a century." "The one and only motion picture, in existence, of the one and only concert The Beatles would ever perform in Kansas City"
"We cleared out my parent's estate 2 months ago. And there I discovered it… at the bottom of the old drawer, still lying in it's original photolab box with 'Beatles 1964' on the back of the box where I'd feverishly scrawled it in blue ballpoint pen… the one and only motion picture, in existence, of the one and only concert The Beatles would ever perform in Kansas City." The tape is, of course, heading for auction and has a conservative guide price of £4000-£6000. Berkshire (UK) based auctioneers Cameo raise the hammer on 4 November - check here for viewing details and to watch a short preview of the footage.